9:1 Voltage balun. Install November 2016. Requiring a balun to feed a balanced antenna from an un-balanced load with an impedance step up from 50ohms to 450ohms, a 1:9 Voltage balun design using an L15 ferrite toroid cores was selected. 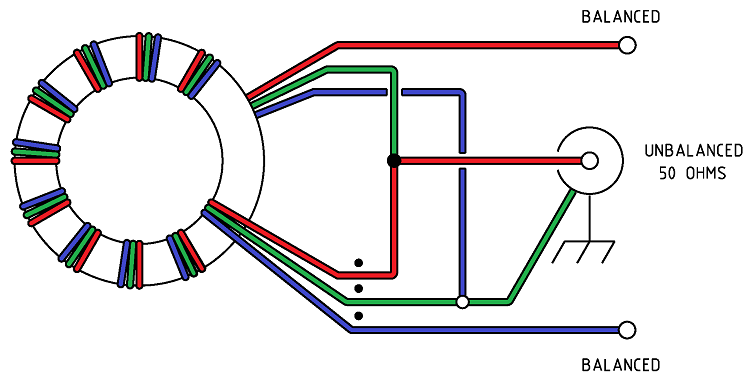 The 1:9 voltage balun has 5 turns wound evenly spaced around the L15 ferrite toroid core with the five individual windings wound close together. The toroidal core was wrapped in an overlapping layer pink heavy duty Teflon plumbers tape to protect the enamelled copper wire from insulation puncture from abrasion with the toroid core. 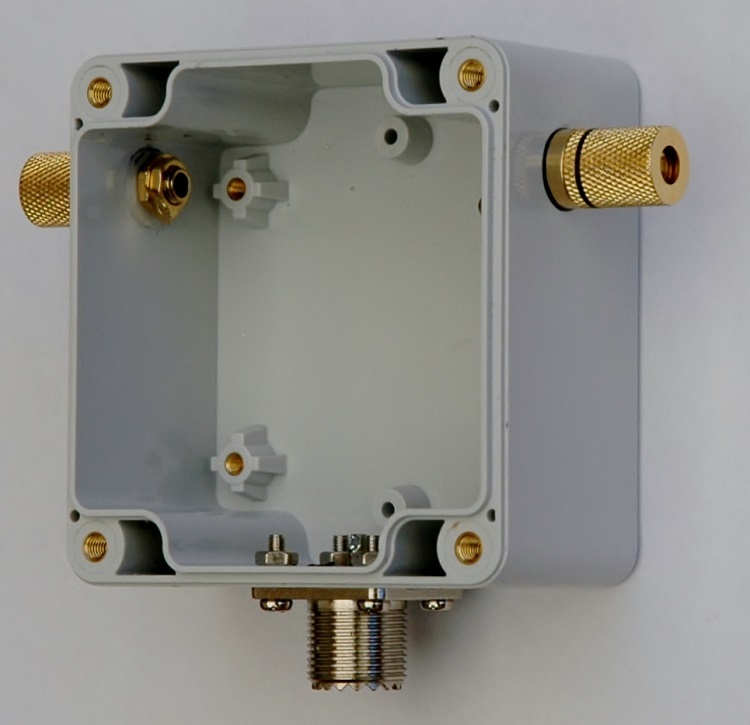 As this Balun will be used out in the weather a weatherproof plastic enclosure is used. See photos 1,2 and 3. The entry holes for the SO-239 connector and the binding post have small bead of rubberised silicon sealant to achieve full waterproofing of the Balun. Photo 2 shows the perfect application of the rubberised silicon sealant spread uniformly from under the binding post, which will also give additional grip if the post were over tightened. About 3 x 500mm of 1.25mm Enamelled copper wire. Photo 1 1:9 Voltage balun enclosure assembled. Photo 2 1:9 Voltage balun enclosure assembled. 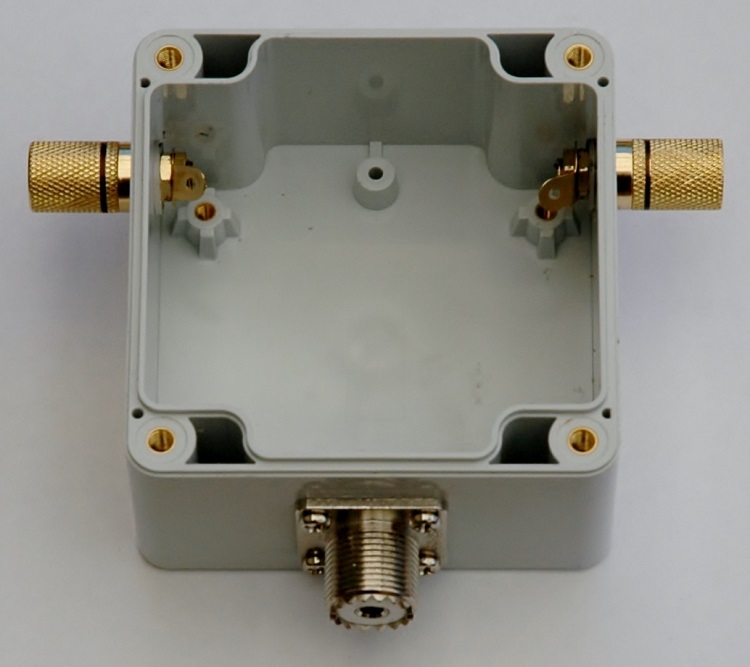 Photo 3 1:9 Voltage balun assembled in weatherproof enclosure. The evaluation of the efficiency of the balun over the desired bandwidth (1.0 - 30MHz) was carried out by testing the impedance that could be seen from unbalanced side to a resistive load applied to the balanced side using an antenna analyser. The below antenna analyser plot views a 450ohm resistive load attached to the balanced side of the balun and measured at a nominal impedance of 50ohms presented as anticipated an approximate 50ohm load to the analyser and produced about a 1:1 SWR. The performance of the balun from 1.0MHz to about 30MHz is good and shows little reactance, there is however a gradual rise in reactance above 30MHz along with a gradual rise in the SWR. Despite this rise in reactance and SWR the balun should still perform well up into the 50MHz amateur band. 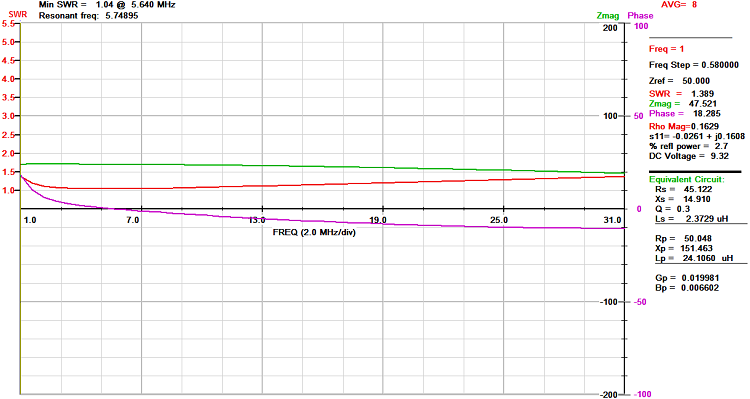 Figure 3 AIM 4170C antenna analyser plot viewing a 450ohm resistive load through the voltage balun. 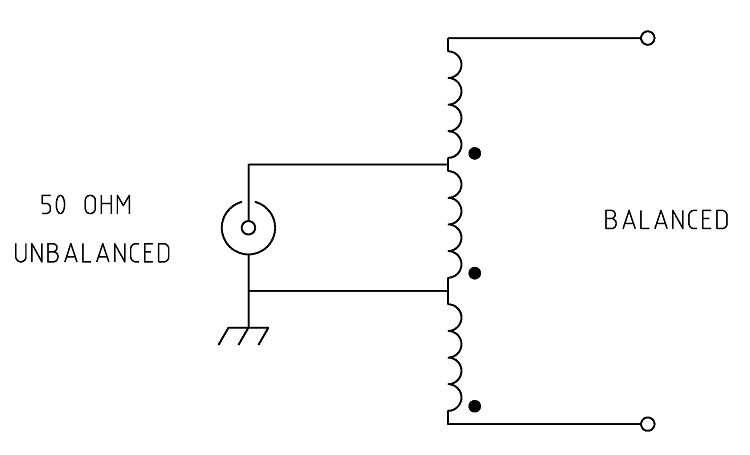 Note the 450ohm resistor appears as 50ohms due to the 9:1 balun ratio resulting in an ideal SWR of 1:1.